NOAA (the National Oceanic and Atmospheric Administration) had predicted a cooler, wetter winter than average for us, which I was looking forward to. It was maybe a little cooler than usual, but I didn’t get the weeks of cold wet weather I love (so that I can sit inside and read guilt-free), and now spring is here. The trees are leafing out, and the insects have started to appear. So I will just switch gears and enjoy spotting wild creatures. 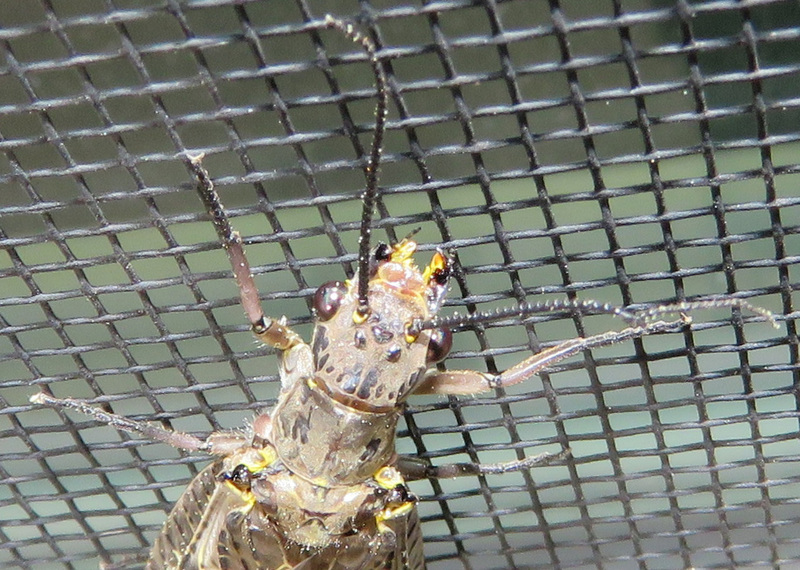 This lovely insect was on my window screen the other day. I’m sure it had come up the night before, attracted by the lamp inside. I did not measure it but I believe it was about 2 inches (5 cm) long. I was really struck by the beautiful sweeping lines on its wings. Close-up of its head and neck. Doesn’t it look like another insect is peeking out from between its wings? I thought it might be in the Dobsonfly family, and found it in the Kaufman Field Guide to Insects of North America on the same page, but it is a Fishfly; in the same family, Corydalidae, in the sub-family Chauliodinae, but after that, BugGuide has six genera, and I give up trying to classify this exact insect. 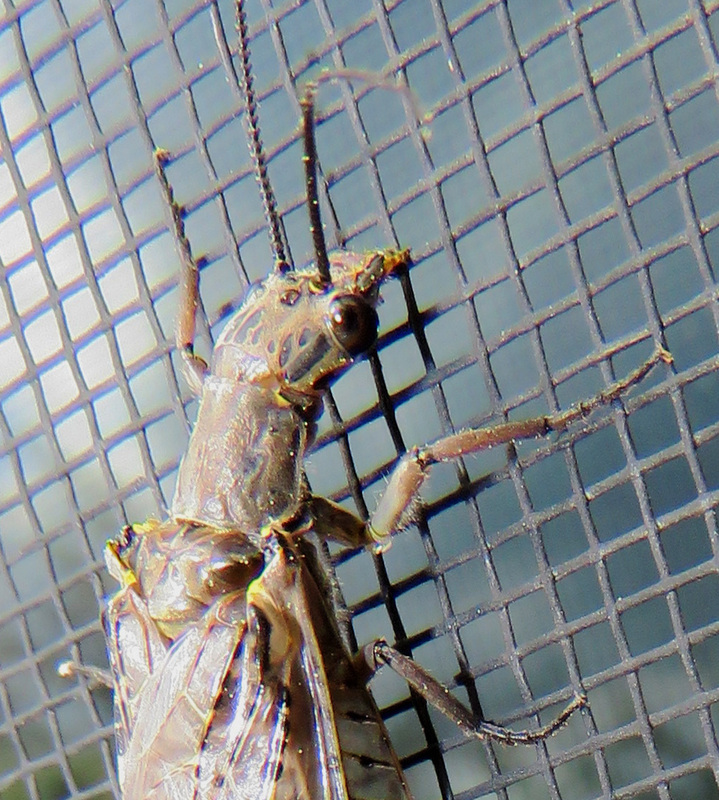 The guidebook says that the larvae are predatory but that adults eat either nectar or nothing, but that female Dobsonflies can deliver a painful bite. Those mandibles look capable of biting. At this angle, it shows up pretty well against the stick, but later it moved around to the outside of the angle, and looked like just a bump on the stick. I wonder how long they live in the adult stage. I am always so amazed at how complex insects are when you look at them close up, especially when they are a species that doesn’t spend a lot of time in the adult stage! Those are gorgeous photos. I don’t know that insect, but he’s a looker! I was glad he showed up on the screen where he was easy to notice! I too – but in the UK – was looking forward to a cooler winter for the same reasons as you 🙂 but we got the rain, not the proper cold, alas. Interesting that you didn’t get more rain. And yes – the wintry moment has passed and it is now spring! Your fishfly is just a delight – I’ve never seen or heard of one before. 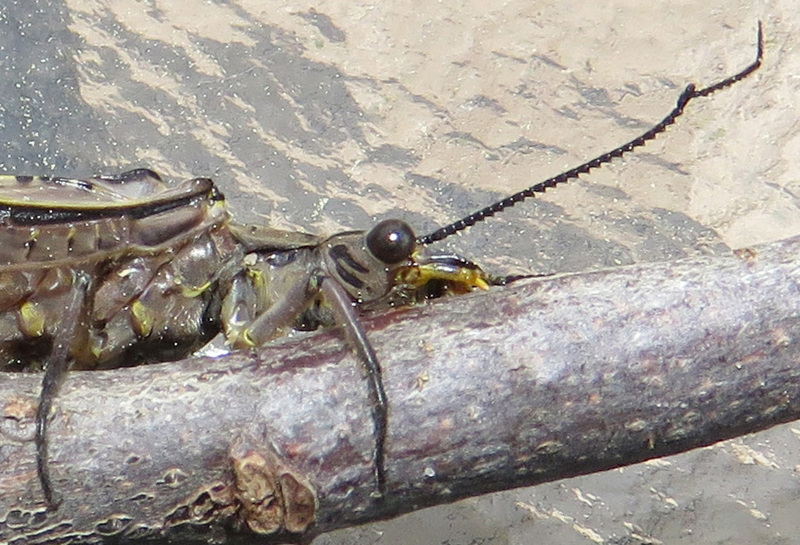 Just fascinating seeing bugs like that up close and personal. I have never seen one before either! I wonder if it is a portent of a warmer, wetter summer. We will have to see. After living here for 7 years, I am just now getting to the point of knowing when the birds and snakes should be doing certain things — I hope I start to notice patterns with the bugs too! Lordy. I just don’t want to meet one in a dark alley . . .
Never heard of a fishfly..but those wings are gorgeous. Would love to see the wings spread out, bet they are a sight to see. I agree, I was waiting on lots of rain; while we did get some, we didn’t get the cold here either. Have a large rain system moving in over the weekend, but now we’re getting into “Spring” storms. I’ve got trees in the back yard already leafing out so spring is definitely here. . Yes, I tried to get it to spread out but it just sat there. And if it rains here this week, I will be sad because I have early spring break plans! Anytime after this coming week would be fine! We’re supposed to start getting rain on Sunday, so depending on how slow/fast it progresses, it may not rain there till later in week. Plus it’s supposed to be scattered showers at first. Time will tell.